I’ve been thinking about the members’ forum at this year’s AALL. There were a couple issues that came up, seemingly disparate. This item was introduced gingerly, with the moderator and executive board members obviously waiting for a bunch of angry responses. They had 2 former presidents of the association all ready primed with prepared statements about why it is such a terrific idea and why it’s the future of the association. They sort of didn’t know what to do when they received very little feedback from a fairly silent audience. I stood up and asked them if they would consider issuing any position statement to explain in more detail than had yet been given the reasons for this dramatic and sudden move. The answer was not exactly a position paper, but FAQs, which seems to be the preferred way to communicate with membership these days. People have lost track of how many changes have already been made to the membership category that includes vendors, and there is actually a great deal of confusion right now about what membership rights vendor-employed AALL members already have, so I look forward to the FAQs. But I still do not understand why we are rushing the way we are doing, and I really feel that the process is being non-transparent and procedurally unfair. I might feel less concerned about the content of the bylaw if the process were less stink-intensive! This item was brought up by Steve Lastres, the outgoing chair of the PLL SIS. He was very upset with the change. He felt, and probably represented the feeling of many PLL members, that the SIS had worked long and hard to build up a successful program. And now that it was hugely successful, AALL wanted to take it over. (The author has removed part of this post. She replaced it with the following sentences. BMcK 8/14/12). The moderator in replying to Steve's comments made a statement that could be easily misconstrued. In the heat of the moment, disgruntled, possibly angry listeners could easily mis-hear the statement and believe the statement was making things much worse and more outrageous than Steve's original comments. It was simply an example of making a response off the cuff into an emotionally charged environment. b. lacks any opportunity for members to give input or to even hear in a timely fashion about the decisions. I still say that putting the board books out for member information is NOT transparency! Look at the ALA website and see what they are doing for membership information… All you have to do is just cut and paste to put that stuff out on the website. Or maybe abandon the boardbook concept entirely and use the web minutes concept for the board, who might prefer that, anyway! c. There is a sense that there is impatience with the slow and clunky workings of democracy. It’s messy and takes time to bring people along. But that’s what it takes – you have to take time to educate people and let them think about the issue. People are not stupid, and they are not malevolent. They need to understand the issue, and if you treat them with respect, usually, they will come to a reasonable opinion. It may not be the same as your own, but it will not be a lunatic position. d. The lack of respect for members who are not on the executive board, or not in the “inner circle” has a lot to do with the fact that AALL may be losing members or that current members are putting their energies into other associations. I am starting to think that way myself. And that is pretty darned sad. I think ALA or SLA could very easily win a sizeable chunk of PLL members right now. They are pissed, and I think rightly so. There may be good reasons to centralize the Summit. But you don’t just come in and seize programming that an SIS has worked to build up til it’s the best educational programming that ran at the meeting. There was a reason that it was the best stuff there for the private librarians, and that was because it was sponsored. If they walk out, to form a new association, I might just go with them. Here is a link to Aretha Franklin singing RESPECT! sing it, woman! 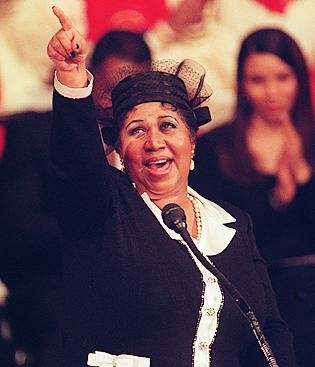 (the image of Aretha Franklin is from http://www.aretha-franklin.com/, and looks to be from the day she sang for President Obama's inauguration in 2008. I'd just like to ask my readers to read this post carefully. I am NOT saying that AALL Executive Director Kate Hagan takes any money! I am saying that the speaker at the Forum spoke in a clumsy fashion that implied, certainly incorrectly, that it was the reason behind centralizing the PLL-SIS Summit. I think your post is very clear that you are not accusing Kate of any nefarious dealings. I agree with your observations and conclusions, Betsy. I spoke to a number of attendees at the recent AALL conference who were wondering whether SLA would be a better fit for their professional development needs, based primarily on the quality of the programming this year at AALL. They were not impressed with what was offered, and felt the registration fee was high for what they got. That was certainly my impression.